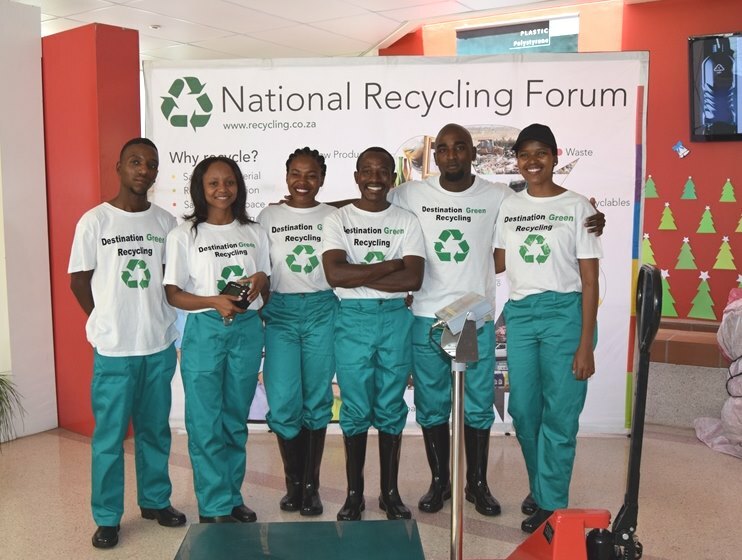 The National Recycling Forum (NRF) focus their efforts on supporting young recycling entrepreneurs with their growing businesses. One such company is Songimvelo led by Irvin Khumalo and Hugo Ngcobo. Songimvelo grabbed the NRF’s attention because of their great ingenuity and perseverance in creating sustainable and successful businesses within the recycling industry. These youth are at the forefront of the sustainability movement towards a healthier, living planet, carving out a path for their peers to follow. Irvin Khumalo is constantly inspired by his love for Mother Nature. He has a great compassion for the people within his local community and is passionate about any activity that plays a vital role in the wellbeing of that community. He has also been fascinated by the changing planet for as long as he can remember. It is no surprise that he teamed up with fellow entrepreneur and philanthropist, Hugo Ngcobo, to create Songimvelo, a company dedicated to bringing environmental awareness and education campaigns to local communities. The company was the outcome of Irvin and Hugo’s deep-rooted desire to promote environmental and sustainable waste management and recycling practices, and provide their local communities with practical tools and solutions to make the necessary change within their immediate environment. Hugo and Irvin were also able to provide employment to individuals within their community, helping to address the issues of unemployment and poverty. In an effort to encourage the other young members of their community to become champions for sustainability, they decided to take their educational activities to the local schools. They have addressed 36 500 learners at 49 schools, inspiring 30 of these schools to enter into agreements with Songimvelo to participate in its waste recycling scheme and providing these schools with the infrastructure needed to implement proper recycling practices. Being entrepreneurs at heart, having honed their business skills from an early age, both men knew that Songimvelo would need a steady cash flow in order to be sustainable as a business and support their outreach and educational activities. Motivated by ambition, passion and self-proclaimed craziness, they pursued and secured contracts to provide recycling services to organisers of some of Pietermaritzburg’s biggest events, including the Nelson Mandela Marathon, the Ukhozi FM Birthday Celebration, the Comrade’s Marathon and a number of Harry Gwala Stadium events. Their company has also undertaken numerous voluntary clean-up campaigns in various neighborhoods, initiating curbside collection programmes from households, businesses and schools, and buying recyclable waste from collectors operating within the Pietermaritzburg area. Through the perseverance and ingenuity of these two youth ambassadors and leaders, Songimvelo has managed to save and divert almost 80 tons of recyclable waste away from the New England Road landfill site, as well as reducing the number of illegal dumping areas within the area in which they operate. The New England Road landfill site has an expected life span of less than 5 years, but the efforts of these two recycling champions will likely lead to an extension of that period as a result of their Separation-at-Source program. “Recycling is not going to solve all of our problems but it’s the only thing taking us closer to the solution,” says Hugo. If you would like more information on Songimvelo, contact Hugo at songimvelorecyclers@gmail.com or 071 109 0287.